Hanover VA. – On September 29, 2015, investigators arrested Ross W. Franklin, 27, of Mechanicsville, and charged him with burglary and attempted grand larceny in connection with an incident that occurred on September 24, 2015, in the 10000 block of Oak Cottage Drive in Mechanicsville. Additional charges were obtained against Franklin for resisting arrest and obstruction of justice by force. He is currently being held at Pamunkey Regional Jail with no bond. Between September 17 and September 26, 2015, the Sheriff’s Office received multiple reports of an unknown person entering homes during the night time hours in an apparent attempt at theft. These incidents occurred in the New Ashcake Road corridor, including the subdivisions of AshCreek and Fox Head. In these incidents, the homes had unlocked exterior doors that were used to enter the residence. On September 27, 2015, the Sheriff’s Office responded to Atlee Little League for a report of a suspicious person attempting to enter cars in the parking lot. 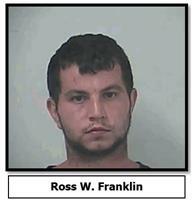 As a result of that investigation, Ross W. Franklin was arrested and charged with trespassing. After further investigation, Franklin was also charged with burglary and attempted petit larceny in connection with an incident on April 2, 2015 in the 8400 block of Truman Road. The Sheriff’s Office continues to aggressively investigate these incidents and follow-up on leads. Expect to continue to see increased patrols in the area as we continue with the investigation. As a normal practice, please keep your homes and vehicles locked, exterior lights on, and blinds closed after dark in order to reduce opportunity and not advertise any valuables. Remember to report any suspicious activity to the Sheriff’s Office immediately by dialing 911 or the non-emergency number 804-365-6140.